It’s obviously sad to see him play the way that he played in the last tournament. They always say, “live your day as if it is the last”, and maybe they say, “play every tournament as if it is the last”, or “each game”, but I guess in retrospect… for all I know he may have enjoyed it, but it didn’t seem like a pleasant way to go. I don’t know him that well. Personally I cannot imagine being in that situation. I can definitely understand being apathetic about losing, but to still enjoy the process having been at the top for so many years and beating Garry, being World Champion, everything. Nah, it’s a bit hard to imagine. So yeah, I think he was certainly trying to play enterprisingly, but I don’t think he had fun. Kramnik had played in the 2018 Candidates Tournament in Berlin as a wild card, and one of the only weak points on his CV is that he never actually qualified for a World Championship match – he’d lost a match to Alexei Shirov and was only picked to play Garry Kasparov in 2000 after the Kasparov-Shirov match fell through. Still, it seemed strange timing to bring that up… and to double-down with another tweet! No, there’s no beef! We’ve been good for many years. We played some training games, as has been well-documented, before the World Rapid and Blitz in Berlin, and even before that we had some little wars of words, and definitely some different opinions on certain subjects, but there were never really any problems, and I would say the last few years we’ve gotten along really well. Basically, I thought of another jibe – I was desperately searching the internet for Vlad’s quote about Nakamura from a few years ago, when he was asked whether he could become World Champion, and he said something along the lines of, “maybe if we all retire!”, and then I couldn’t find that quote, so I went with the next best thing! Did Magnus grow up watching Kramnik’s games? 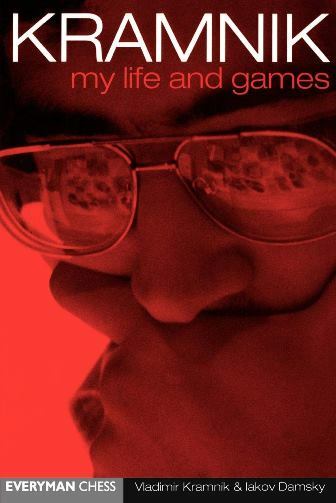 I didn’t really grow up watching his games that much, but I read the book, Kramnik, My Life and Games, which came out I think in 2001 or something, and that became one of my very favourite books growing up, and I absolutely loved his way of playing, his style, and just the richness of ideas in his play, which is still there. I admire him very much and that’s not going to change. 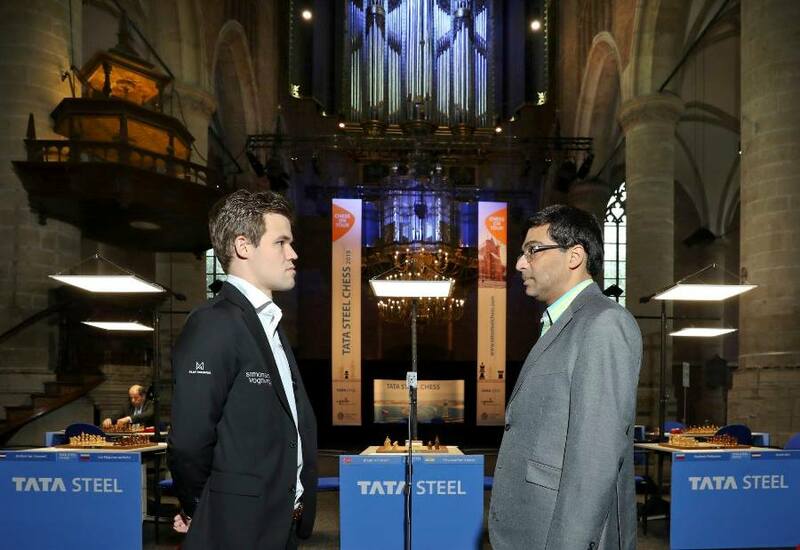 Magnus started 2019 by winning the Tata Steel Masters with an unbeaten 9/13, though things started slowly, as he added four more draws to 17 in the preceding games. I cannot say that I was following the Twitterati and all that at the start of the tournament, but to be honest I didn’t feel like I did anything particularly wrong at the start. I was just not getting any points, but it was still annoying me. After 21 draws in a row I think that would affect anybody, even though you sort of feel like you’re doing the right things and there’s not too much you can change. A part of me always thought that at some point the wins are going to come, and they’re going to come fast, but when you keep drawing inevitably you start doubting yourself a little. Of course it’s very pleasant to get that first win. One of the most curious games of the tournament was Carlsen’s win against Richard Rapport in Round 8. He played what appeared to be a beautiful game, with a positional pawn sac leading to a crushing position that he then smoothly finished off. Afterwards, however, he was playing down praise of the game, and he passed it over in silence when talking about his best games in the post-game press conference. Results-wise my tournament was very much like last year. Then I also won my last four Whites after having won the first one as Black, so it was very similar, but I feel like the quality of play was better this year, apart from one moment, which I should like to address, because I’m living a lie and it’s bearing down on my conscience! It’s about the game against Rapport, which I think was considered to be a pretty good game… The point is that I blundered a pawn! When I played the move 25.e5 I didn’t see that he could take on g2, then take on e5! And to me it felt like pure beginner’s luck. You get this position which looks so beautiful, and when he allowed e5 I really just thought that he felt that his position was so poor that he was looking for some weird chances with Bf8 and Re6 or something, and it didn’t occur to me you could simply take the pawn. The rest of the game was kind of funny because I was just feeling so ridiculously dumb, so that was why it was kind of hard for me to feel good about the game, because even though after that it went swimmingly it was all based on a very, very basic oversight. …he’s already in a real spot of bother, because even though he has lots of time it’s very hard to calculate once you see that 70…bxa5 71.Kd5 Nf4+ 72.Kxc5 Ne2 73.Nd6 doesn’t make a draw on the spot. Then it almost becomes guesswork. You cannot see a forced draw, so you just have to evaluate whether the resulting position is a draw or not, which I think is very, very difficult, because I could see lines that led to a draw, but I could also see lines that won for me. I cannot blame him too much for going 70…b5, and for me at that point it was not a question of, “does this win?” or “does that draw?” – just “does this keep the game going or not?” was the real question. So even after b5 I didn’t know whether I was winning or not, but that was not really a big issue. I was just happy that the game was still on. First of all we get this position from the opening, and I think you were there, trying to sell me on this concept, and I said something along the lines of, “why cannot Black just play 15…Bc5 and 16…h6?” I don’t think we looked any further. There was just I can sort of recall 17.Bxh6 gxh6 18.Qd2 and +1. I think that was what was being said, and then we moved on, but I didn’t know really what that +1 consisted of. Magnus got there in the end, and took a half-point lead into the final game against Giri. 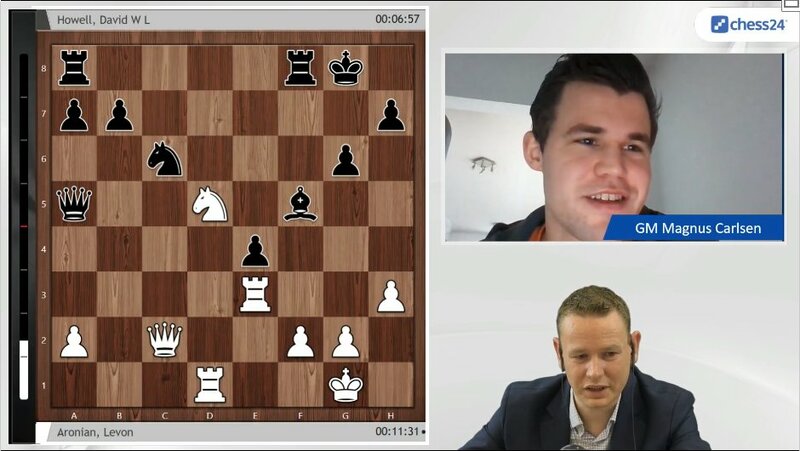 That encounter was a strange one for both players, with Magnus admitting he got “a bit lazy” and also miscalculated near the end. When Giri played 28.Qc6! Carlsen had only been expecting 28.Qd5, when Black is significantly better. Overall assessment of the tournament? I’m very happy with my performance. 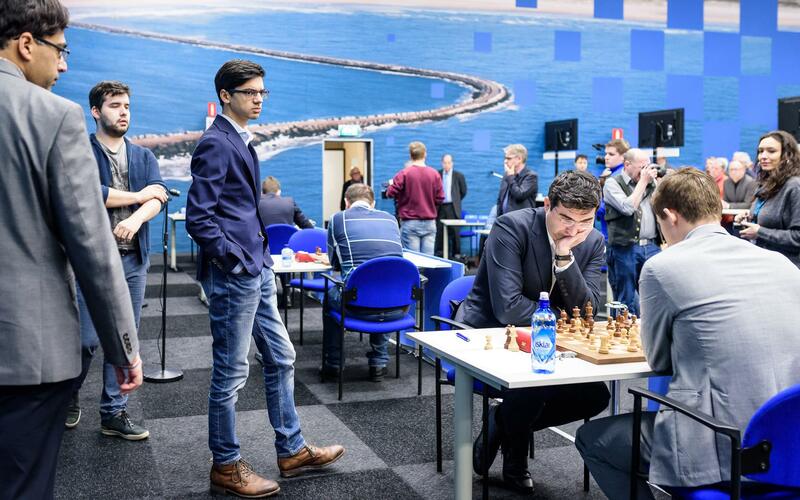 Apart from the game against Rapport I don’t think I made any outright blunders, and even that one turned out to be a very good move, so yeah, it was definitely a good performance, and it’s nice to have a tournament where you have no particular regrets - just very satisfied. Obviously I can still do better, but it’s such a step up from what I’ve been doing recently and I’ve felt like the process was good. As long as the process is good and the result is good I must be happy. It’s still early to say in terms of regaining my former strength or whatever. It was one tournament, so it’s hard to say! I wouldn’t say I almost won the rapid - I was in contention for one round out of 15! Obviously the narrative was good: starting so poorly, finishing out the rapid well and then having a very good result at blitz was good… It’s still bothers me. I feel like the triple crown is there for the taking, and I’m just not ready. At the start I feel ready, but clearly I’m not. It feels like a wasted chance, but in the end with one title I cannot be unhappy and being undefeated in blitz was lovely. Once again, serious room for improvement there! I think it’s me, Fabi, everybody else. He didn’t play here, so I would still kind of put him in the same group as myself. I didn’t think Ding did poorly at all in Wijk aan Zee, but winning two games is just not going to cut it! But it has to be said he faced some stern defence, and he didn’t get anything for free, so to say, but yeah, clearly it’s a case of one or two players now above the rest… I don’t know what was wrong with Shak, or I don’t want to speculate, but clearly that was far from his finest hour. I’m going to play GRENKE, and then probably something before that, but that isn’t completely clarified yet. I would love to play. I felt like I had a lot of energy right at the end of the tournament and just wanted to keep going, so it’s a bit of a shame to have a break now, but it seems that is the way it must be, but I would really love to play something before late April – very open to suggestions! Whenever I watch games I just try if I can at all to watch without computer analysis, because you simply stop thinking. I like the activity level. They’re just flying around and doing things… It remains to be seen how effective those measures will be, but I like the activity level, and at this early stage you cannot ask for more, so I’m cautiously optimistic. Fans of the NBA and Norwegian TV should also catch the last couple of minutes of the show! That’s all for Magnus, but there won’t be long to wait until we also release an interview with the player who finished 2nd in Wijk aan Zee – world no. 4 and Carlsen's arch-Twitter-enemy Anish Giri. Stay tuned to our shows page!